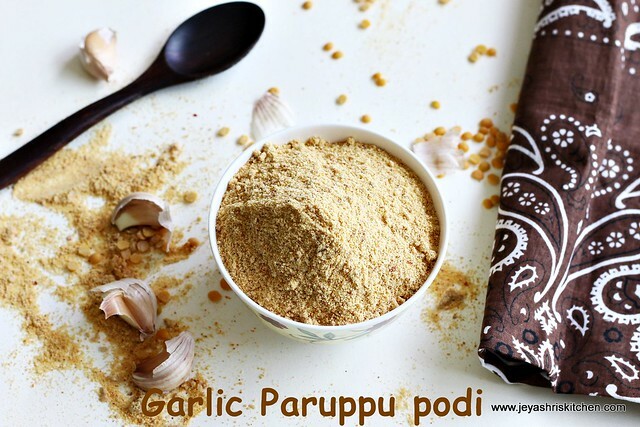 Paruppu podi we make generally without adding garlic. 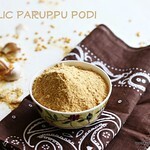 I have posted the recipe of paruppu podi HERE. 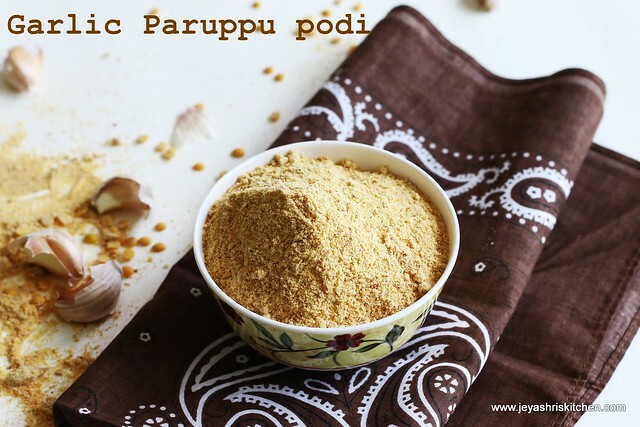 This recipe of andhra style paruppu podi | kandi podi, i learnt from my friend. 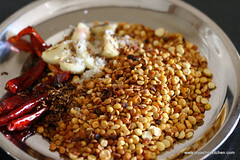 I have already posted a Pottukadalai podi too. This podi was too flavourful. 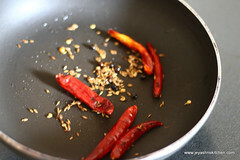 I didn't make it very spicy but if you want you can add extra few red chilly. 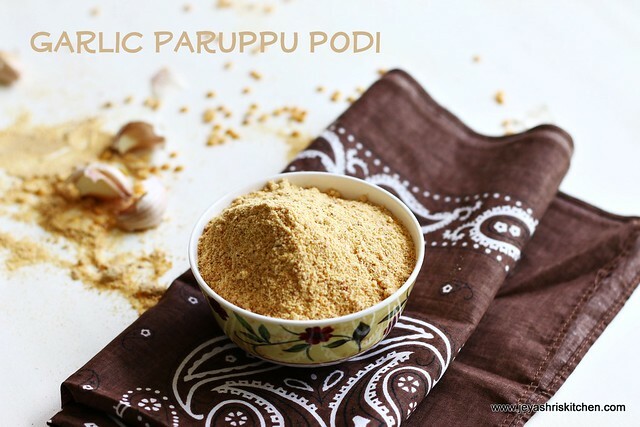 This is a simple and quick podi recipe, taste divine when mixed with hot rice and ghee. 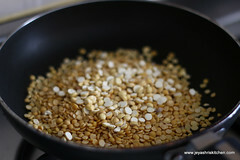 In a pan add oil and roast the toor dal and roasted gram . Roast it in a low flame till it becomes golden brown color. Be careful not to get it burnt. Else it will spoil the taste. 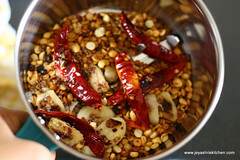 Take it out and roast the red chilli, black pepper and cumin seeds. Roast them in a slow flame. Keep it aside and roast the garlic . Actually i added 7 garlic pods but after tasting i felt i needs some more to get the flavor. 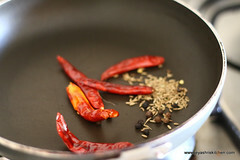 When the garlic gets roasted, add salt to this and switch off the flame. Grind this into a fine powder. 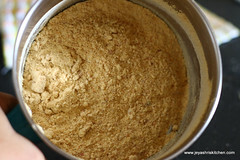 Garlic paruppu podi is ready. Enjoy this paruppu podi with hot rice smeared with ghee. Nice post Jaishri. You ve missed out letter C in the post title. 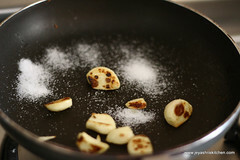 I love garlic recipes in any form...!!! Looks perfect. Yummy with rice. I love the garlic flavour too.. yum! wow...I love to have it now!! 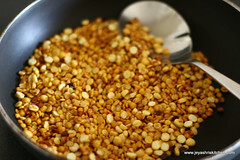 This garlic paruppu podi is torturing me..
Hi jeyashri, How long we can store this podi?